Background: Curcumin (diferuloylmethane), the active constituent of turmeric extract has potent anti-cancer properties have been demonstrated in hepatocellular carcinoma (HCC). However, its underlying molecular mechanism of therapeutic effects remains unclear. Vascular endothelial growth factor (VEGF) and its receptors (VEGFRs) have crucial roles in tumor angiogenesis. Purpose: The goal of this study was to investigate the role of the VEGF/VEGFRs mediated angiogenesis during the proliferation and apoptosis of human HepG2 hepatoma cell line and the effect of curcumin-loaded nanostructured lipid carriers (Cur-NLC). Materials and Methods: The proliferation of HepG2 cells was determined by methyl thiazolyl tetrazolium after exposure to Cur-NLC and native curcumin. Apoptosis was quantified by flow cytometry with annexin V-fluorescein isothiocyanate and propidium iodide staining. Cellular internalization of Cur-NLC was observed by fluorescent microscope. The level of VEGF was detected by enzyme-linked immunosorbent assay kits. The expression of VEGFRs was quantified by Western blotting. Results: Cur-NLC was more effective in inhibiting the proliferation and enhancing the apoptosis of HepG2 cells than native curcumin. Fluorescent microscope analysis showed that HepG2 cells internalized Cur-NLC more effectively than native curcumin. 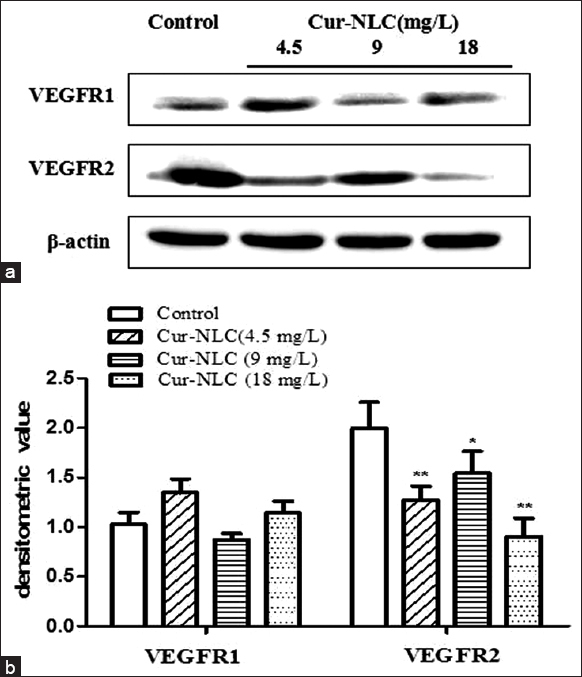 Furthermore, Cur-NLC down-regulated the level of VEGF and the expression of VEGFR-2, but had a slight effect on VEGFR-1. Conclusion: These results clearly demonstrated that Cur-NLC was more effective in anti-cancer activity than the free form of curcumin. These studies demonstrate for the 1 st time that Cur-NLC exerts an antitumor effect on HepG2 cells by modulating VEGF/VEGFRs signaling pathway. Hepatocellular carcinoma (HCC), a kind of hypervascular solid tumor, which is one of the most prevalent cancers worldwide and third leading cause of tumor mortality. In many types of solid tumors, especially in HCC, angiogenesis as a malignancy characterized by obvious hypervascularization is indispensable for their growth and maintenance. Conventional therapies such as chemotherapy, surgical treatments, radiation, and combinational chemotherapy are widely accepted to treat HCC. However, there are lots of drawbacks, e.g., nonselective distribution of drugs, recurrence, multidrug resistance, widespread systemic toxicity, and undesirable side effect to normal tissue. , In order to overcome common major obstacles in conventional cancer therapeutics, novel therapies are critical in need of exploration to cut down the incidence of HCC. In our previous research, curcumin-loaded nanostructured lipid carriers (Cur-NLC) was prepared successfully with high drug entrapment efficiency and loading capacity and showed markedly greater water solubility than free curcumin. Nevertheless, it remains unclear whether Cur-NLC could regulate the expression of VEGF and VEGFRs and prevent the progress of angiogenesis in HCC or not. The aim of this study was to gain insight into the role of VEGF/VEGFRs axis involved in the effects of Cur-NLC on HepG2 cell proliferation and apoptosis. We hypothesize that the VEGF/VEGFRs axis plays an important role in the proliferation and apoptosis of HCC cells. Therefore, the cultured human HepG2 hepatoma cell line was used as a model system to study the effects of the VEGF/VEGFRs axis on cell growth. Furthermore, the effects of Cur-NLC on HepG2 cell proliferation, apoptosis, VEGF, and VEGFRs expression were determined. Curcumin (C 21 H 20 O 6 , MW: 368.39, >95%) was purchased from Henan Guangye Natural Pigment Co., Ltd., China. The following chemicals were used in the study: RPMI-1640 medium and defined fetal bovine serum (FBS) was obtained from Gibco Co., (Grand Island, USA). Methyl thiazolyl tetrazolium (MTT) were purchased from Sigma Chemical Co., (St. Louis, MO, USA). Dimethyl sulfoxide (DMSO) was obtained from Hao yang Bio-engineering Limited Company (Tianjin, China). VEGFR-1 and VEGFR-2 primary antibodies were purchased from Santa Cruz Biotechnology (Santa Cruz, California, USA). VEGF enzyme-linked immunosorbent assay (ELISA) kits were purchased from Shanghai yuanye Bio-Technology Co., Ltd., China. Other chemicals used in the experiment were analytical grade from commercial sources. Curcumin-loaded nanostructured lipid carriers were provided by the Department of Pharmacokinetics Lab, Anhui University of Chinese Medicine. Cur-NLC was prepared by emulsion-evaporation and low temperature-solidification method, which was described in detail by our study previously. Briefly, the lipophilic surfactant and the lipid phase were dissolved in the right amount of organic solvents and heated up to 75°C to obtain a homogeneous solution. Following the addition of curcumin, the hot lipid phase was dispersed into the aqueous solution of hydrophilic surfactant and heated at the same temperature. Then preemulsion was formed by high speed stirring (1000 rpm) for 2 h. The resulting hot o/w nanoemulsion was dumped into ice cold distilled water (0°C) quickly subjected to mild mechanical for 2 h. Cur-NLC was formed by lipid recrystallization. The empty NLC was also formed by the same procedure without adding curcumin. Human HCC cell line HepG2 was purchased from the Shanghai Cell Bank, Chinese Academy of Sciences (Shanghai, China). HepG2 cell line was placed in the RPMI-1640 medium with 10% FBS, 100 U/mL penicillin, and 100 μg/mL streptomycin in a humidified cell incubator with an atmosphere of 5% CO 2 at 37°C. Exponentially, growing cells were used for experiments. Cur-NLC, empty NLC, and native curcumin were prepared as an 80 mg/L stock solution in DMSO stored in − 20°C and diluted to different working concentrations with the medium before use. The cytotoxicity of native curcumin and Cur-NLC was determined in HepG2 cells using MTT dye assay. The day before the experiment, HepG2 cells (3 × 10 4 cells per well) were seeded into 96-well culture plates (200 μl per well) with serum-starved RPMI-1640 medium at 37°C, 5% CO 2 for 24 h. The following day, the medium was changed, and the cells were exposed to a series of different concentrations of free curcumin, Cur-NLC, and empty NLC nanoparticles for 48 h. Then, the culture medium from each well was removed, and the cells were washed twice with 1 × PBS. 4 h before the termination of culture, about 200 μL of the complete growth culture medium and 20 μL MTT solution (5 mg/mL in PBS, pH 7.4) was added to each well and the plates were then incubated for another 4 h. After incubation at 37°C for an additional 4 h, the cells were centrifuged at 760 × g for 10 min, and all the supernatants were aspirated without disturbing the pellet. The formazan crystals were dissolved by the addition of 150 μl DMSO in each well. After 10 min, absorbance was quantified at 570 nm by using ELISA reader (BioTek Elx × 800 microplate reader, Winooski, VT, USA) and the results were expressed as mean of six wells and as percentages relative to the result obtained with the nontoxic control. The half inhibitive concentration half-maximal inhibitory concentration (IC 50 ) was examined. Data were calculated as the percentage of inhibition by the formula as follows: Inhibition (%) = (1− (the optical density values for experimental groups/the optical density values for control group)) ×100%. All experiments for cell lines exposed to various concentrations of Cur-NLC were performed in triplicate. Cells of different groups were treated with various designated treatments. Cells in logarithmic growth phase were seeded at a concentration of 3 × 10 4 /well in a 6-well microtiter culture plate. A cover slip was placed onto the bottom of each well to allow cells to grow on its surface as a monolayer. After 40-60% confluency, the cells were divided into different treatment groups including native curcumin control group and empty NLC control group. After incubated for 48 h, the cellular morphology were observed and photographed under inverted phase-contrast microscope (Olympus, CK2, Japan). To determine the effects of Cur-NLC on apoptosis, HepG2 cells apoptosis were quantified using an annexin V-fluorescein isothiocyanate/propidium iodide (PI) apoptosis detection kit (Biosea, Beijing, China) that detects phosphatidylserine exposed on the outer surface of the cell membrane. HepG2 cells (5 × 10 6 cells per well) were seeded into six-well plates and incubated until 80% confluency. Cells were treated with various concentrations of Cur-NLC or native curcumin. As controls, cells were also incubated with complete growth culture medium only. After 48 h incubation, cells were harvested by quick trypsinization to minimize potentially high annexin V background levels in adherent cells, washed twice with cold PBS. After centrifugation at 1000 rpm, the supernatant was removed, and the cells were stained with annexin V-fluorescein isothiocyanate and PI. The cells were incubated at room temperature for 15 min in the dark. Cellular events were enumerated and the number of apoptotic cells was assayed with flow cytometry (Becton Dickinson, CA, CT, USA). Cells staining negative for both annexin V and PI are viable. Cells that are annexin V+/PI− are in early apoptosis, whereas cells that are necrotic or in late apoptosis are annexin V+/PI+. Curcumin and Cur-NLC are fluorescent in the visible green-yellow spectrum naturally. To visualize the cellular uptake of Cur-NLC, HepG2 cells were seeded in 24 well plates at a concentration of 2 × 10 5 at 37°C, 5% CO 2 for 24 h. Cells were treated with 30 mg/L Cur-NLC and free curcumin. As curcumin is with poor aqueous solubility, native curcumin was dissolved with DMSO. The final concentration of DMSO in the culture medium was 0.1% at the most. The nanoformulation of Cur-NLC has the advantage of enhanced solubility and, therefore, can be used directly without any organic solvent. After culturing in a 37°C, 5% CO 2 incubator for 2 and 4 h, respectively, the culture medium from each well was removed and the cells were washed with PBS 3 times to remove the unswallowed Cur-NLC and native curcumin in the medium. Cells were observed under a fluorescent microscope (Olympus IX70, Japan) at 488 nm for intracellular Cur-NLC and native curcumin fluorescence. To study the effect of Cur-NLC on cytokines level in HepG2 cells, the cells were seeded into 96-well plates at a density of 1 × 10 6 cells/well with 4 mL of RPMI-1640 medium supplemented with 10% FBS. The cells were divided into 10 groups: Control cells, HepG2 cells, respectively treated with empty nanoparticle, native curcumin, and Cur-NLC at a concentration of three gradients according to IC 50 values. After 48 h, the supernatant was collected. 200 μL of supernatant were added to each well. The level of secreted VEGF under different experimental conditions was determined with conditioned culture media using ELISA kits, according to the manufacturer's instructions. The experiment was performed in triplicate. The optical density of each well was immediately determined at 450 nm using a microplate reader (BioTek Elx × 800 microplate reader, Winooski, VT, USA). HepG2 cells were treated with Cur-NLC at various concentrations. Cells were lysed in RIPA lysis buffer (50 mM tris [hydroxymethyl] aminomethane-HCl, pH 7.4, 10 mM phenylmethylsulfonyl fluoride, 150 mM NaCl, 0.1% sodium dodecyl sulfate [SDS], 1% sodium deoxycholate, 1% Triton X-100, 1 mM ethylenediamine tetraacetic acid [EDTA]) for 25-35 min on ice. Protein concentration was assayed using Lowry Protein Assay. A protein sample was mixed with the 5× sample buffer (4:1) and boiled in water for 15 min at 100°C. The proteins were resolved by SDS-PAGE, and then electroblotted at 4°C transferred onto a polyvinylidene difluoride membrane by electroblotting in transfer buffer (25 Mm Tris base, 192 mM glycine, and 20% methanol). The membranes were blocked with 5% nonfat dry milk dissolved in 0.05% Tween 20-PBS for 2 h at room temperature, membranes were incubated with the mouse anti-VEGFRs with gentle agitation overnight at 4°C. Next day, the membranes were washed 3 times with 0.05% Tween 20-PBS and incubated with secondary antibody at room temperature for 2 h. Immunodetection was carried out using enhanced chemiluminescence reagent (Pierce, Rockford, Illinois, USA), according to the manufacturer's instructions. Equivalent protein's loading and transfer efficiency was checked by staining for β-actin. All the experiments reported in this study were performed 3 times, and the results were reproducible. Autoradiographs were scanned using Image Quant LAS 4000 mini (GE Healthcare Bio-Sciences AB, Uppsala, Sweden) and quantified using the Image Analysis Software. Each experiment was conducted in triplicate and values were expressed as mean ± standard deviation. "n" denotes the sample size in each group. Significant differences between the means were evaluated using a one-way analysis of variance and Student's t-test with the statistical package SPSS 17.0 (SPSS Inc., Chicago, IL, USA). P < 0.05 was considered significant. A series of in vitro functional assays were performed to demonstrate better the anti-cancer properties of Cur-NLC. HepG2 cells were treated with different concentrations (2.5, 5, 10, 20, and 30 mg/L) of native curcumin and Cur-NLC for 48 h. The cells were collected, and proliferation was determined using MTT assay. Our results showed that both native curcumin and Cur-NLC significantly decreased cell viability in HepG2 cells. As shown in [Table 1], Cur-NLC (5, 10, 20 and 30 mg/L) significantly inhibited the cell viability of HepG2 cells by 25.05, 53.18, 64.69, and 71.72%, while after cells treated with native curcumin at identical conditions, 21.72, 37.87, 58.23, and 68.24% of cells was significantly inhibited, respectively. After 48 h incubation, a significant difference in cell viability between native curcumin and Cur-NLC was observed at concentrations of 5, 10, 20, and 30 mg/L. The cell toxicity induced by the chemotherapeutic drug is quantitative measured by way of in vitro IC 50 . The obtained sigmoidal curves of all the studied cell line were used to calculated IC 50 values, and the data indicated that Cur-NLC has higher antiproliferative activity than native curcumin. 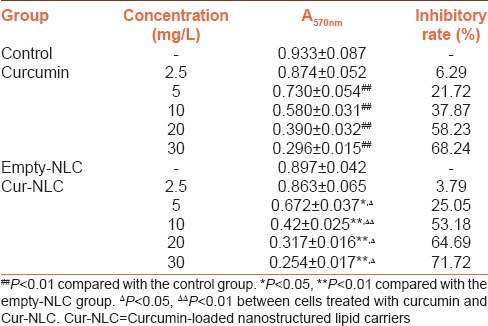 Cur-NLC is about 1.64 times more effective than native curcumin as observed in HepG2 cell line, respectively [Table 2]. That is, Cur-NLC was more effective than native curcumin in the method of controlling HepG2 cells growth. In morphology analysis, phase-contrast microscopy was used to observe the treated cells. It was shown that the attached cell grew well for the negative control. However, compared with the negative control group, the round detached cells started to appear early and the cell density was gradually reduced in the native curcumin (5, 10, and 20 mg/L) treatment groups. After being treated with Cur-NLC (5, 10, and 20 mg/L) for 48 h, the cells were significantly different compared to native curcumin groups. The morphology structure of cells became irregular, which exhibited characteristics of apoptosis such as cell membrane shrinkage, condensation, and fragmentation of nuclear chromatin, as well as the formation of apoptotic bodies. Moreover, a number of cells suspended in the medium [Figure 1]. To determine the roles of Cur-NLC and native curcumin in inducing apoptosis of HepG2 cells, the cells were incubated with various concentrations (2.5, 5, 10, and 30 mg/L) of Cur-NLC or native curcumin for 48 h [Figure 2]a, and apoptosis was quantified by annexin V/PI staining (FACS analysis). Annexin V binds to cells that express phosphatidylserine on the outer layer of the cell membrane, a characteristic feature of cells entering apoptosis. This allows discrimination of live cells (unstained by either fluorochrome) from apoptotic cells (stained with annexin V). As shown in [Figure 2]b, both Cur-NLC and native curcumin increased the percentage of HepG2 cells apoptosis when compared with those of control groups at the concentrations of 2.5, 5, 10, and 30 mg/L. However, Cur-NLC (2.5 and 10 mg/L) treatment increased the percentage of HepG2 cells apoptosis by 5.48% and 23.83%, respectively, when compared with that of native curcumin in [Figure 2]c. These results suggest that Cur-NLC increased the percentage of HepG2 cells apoptosis when compared to native curcumin, and both necrosis and apoptosis contribute to the Cur-NLC-induced death of HepG2 cells. Results shown in [Figure 3] demonstrated a significant difference in the cell uptake between Cur-NLC and free form of curcumin by microscopic images of fluorescence study. We studied their cellular uptake by fluorescent microscopy by taking advantage of the intrinsic green-yellow fluorescence of curcumin. HepG2 cells at the 4 h of incubation with Cur-NLC and native curcumin showed stronger fluorescence than the cell incubated for 2 h. The microscopic images of control cells and empty NLC treatment cells did not show any fluorescence, whereas the images of cells treated with Cur-NLC and native curcumin exhibited green-yellow fluorescence due to the internalized curcumin. HepG2 cells could internalize Cur-NLC more effectively than the free form of curcumin at the same time. Results shown in [Figure 4] demonstrated a significant decrease in the level of in HepG2 cells in Cur-NLC and native curcumin treated groups compared to control group. Consistent with the results of apoptosis, ELISA analysis revealed that when compared to the native curcumin treated cells, the Cur-NLC treated cells showed a marked inhibition in the production of VEGF. However, there is no significant difference between Cur-NLC and native curcumin treated groups. To determine whether Cur-NLC affects the expression of VEGFRs in HepG2 cells, the expression levels of VEGFR-1 and VEGFR-2 were quantified. As shown in [Figure 5], treatments with various concentrations of Cur-NLC (4.5, 9, and 18 mg/L) inhibited VEGFR-2 expression markedly compared with the control-treated cells, but there are no significant change of VEGFR-1 among all groups. The pharmacological data revealed that curcumin is safe and effective which makes it a promising compound for prevention and treatment of many types of cancer. Phase II and III clinical trials with curcumin have advocated its use for patients with colon and pancreatic cancers. ,, The main principle in effective cancer therapy is to achieve the goal of killing specific cancerous cells while minimizing toxicity to normal cells with the desired concentration of therapeutic agents at the tumor site. Despite curcumin's properties is superior as an anti-cancer agent, its applications are limited due to its poor aqueous solubility and low bioavailability. Therefore, growing lists of nano-preparations of this natural product have been prepared to address these critical problems. ,, It was documented that various types of nanocarriers have superior anti-cancer properties and could decrease toxic side effects compared to native curcumin. , Cur-NLC is a kind of nanoformulations, which was prepared successfully with lipid as the carrier by emulsion-evaporation and low temperature-solidification technique in our previous study. The chemopreventive effect of curcumin is largely based on its effectiveness to induce cancer cell apoptosis and inhibit cell proliferation. Accumulating evidences suggest that apoptosis may represent a mechanism to counteract neoplastic development, which is essential for cancer therapy. , In recent years, a growing number of studies on apoptosis have described that native curcumin was responsible for generating apoptosis signals in a varied number of tumor tissues including colorectal, lung, breast, pancreatic, and prostrate carcinoma. , In our study, we found that Cur-NLC markedly induce apoptosis of HepG2 cell line in vitro in comparison to native curcumin. These findings support the view that Cur-NLC is more effective in inducing apoptosis on HCC than native curcumin. Why the apoptosis rate at a concentration of 30 mg/L was lower in [Figure 2]b and there is a few difference between native curcumin and Cur-NLC? We are researching for the reasons in the next work. We think when drugs' concentration exceeding a certain limit, the higher concentration of drug, the more necrosis rate of HepG2 cells. Previous reports have indicated that curcumin induced cell arrest and inhibited cell proliferation in pancreatic, lung adenocarcinoma,  and breast cancer. Our experiment confirmed that Cur-NLC showed a lower IC 50 values when compared with native curcumin, as studied in HepG2 cells. This data provide evidence that Cur-NLC could significantly reduce the viability of HepG2 cell in vitro in comparison to native curcumin. The difference in uptake profile might be the reason for the better antiproliferative effect of Cur-NLC. 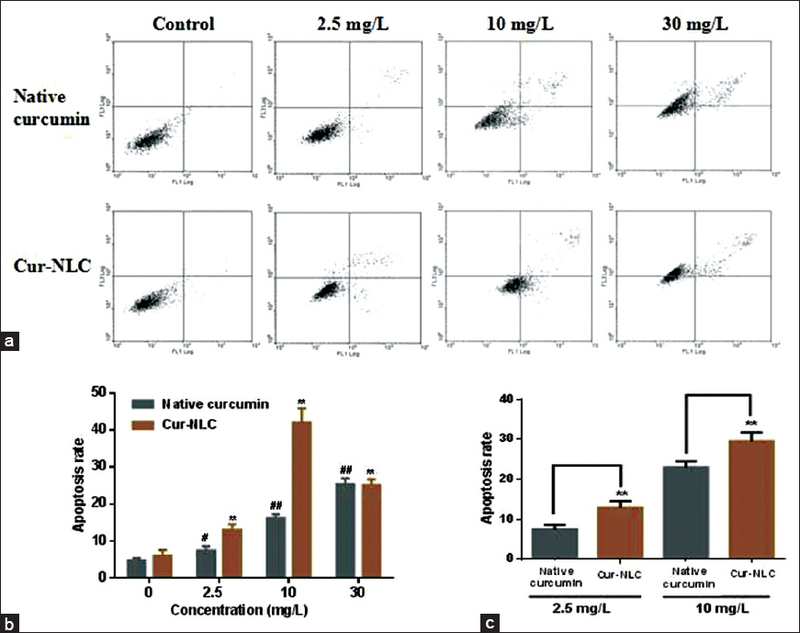 Consistent with the results of the cell proliferation assay, our study showed that the uptake profile of Cur-NLC in HepG2 cells was markedly enhanced when compared with native curcumin. It is well-known that the antiproliferative activity of agent is very well-correlated with the duration of its intracellular retention and drug's stability. It always moves across the cell membrane (when used as a solution), while observing the internalized mode of the free form of the drug into the cell. Thus, after reaching saturation inside the cytoplasm, further entry will be confined. Antiproliferative activity of these small fractions of internalized native curcumin was shown for a very short time of its existence. However, abundant availability of Cur-NLC inside the cell was made by the mode of entry of nanocarrier to the cell through endocytosis and encapsulated curcumin was released in a sustained manner to exert cell toxicity. Therefore, Cur-NLC as a type of nanoformulation will be more effective in anti-cancer properties than the free form of curcumin by improving their cell uptake. Angiogenesis plays a critical role in tumor growth. Blocking angiogenesis represents an effective approach to HCC chemoprevention. VEGF level as a prognostic biomarker of angiogenesis plays a key role in the context of multiple tumors. , Targeting VEGF therapy has been shown to be helpful as an anti-angiogenic tumor therapy. ,[ 16] Emerging evidences indicate that numerous tumors produce VEGF and inhibition of VEGF-induced angiogenesis markedly inhibits tumor growth in vivo, which support the opinion of the clinical importance of VEGF in tumor growth. Xu et al. found that curcumin inhibits proliferation and induces apoptosis of human HCC cells in a concentration-dependent manner via a transcriptional decrease of many genes related to cell growth, survival, and apoptosis including VEGF by RT-PCR experiment. In vivo study demonstrated that curcumin can play its antitumor effect by inhibiting VEGF synthesis and tumor angiogenesis in liver cancer mice. Our results supported these findings that curcumin inhibited the production of VEGF on HCC as we observed in HepG2 cells. It is found that VEGFR-1 and VEGFR-2 are associated with the progression of many types of tumors including HCC. VEGFR-1 expression is associated with HCC's progression and worse outcome as a novel and independent prognostic biomarker for patients with HCC. In vitro study found VEGFR-1 is expressed and predominantly localized on the cytomembrane of HCC cell lines. However, VEGFR-1 might not directly relate to angiogenesis that facilitates HCC growth, since its expression was not correlated with tumor size. A growing number of studies demonstrate that VEGFR-2 is predominantly responsible for responses of vascular endothelial cells to VEGF under both physiological and pathological conditions. VEGFR-2 as a critical role in tumor angiogenesis has been explored as a therapeutic target. In mouse models, anti-VEGFR-2 antibody inhibits primary and metastatic tumor growth. Kiran et al. found curcumin caused an upregulation of VEGF and its receptor VEGFR-2, which indicated that curcumin may exert a proangiogenic effect on human umbilical vein endothelial cells in matrigel. Consistent with the results, our experiments showed that Cur-NLC treatment have significantly up regulated level of VEGF, and downregulated protein expression of VEGFR-2 in HepG2 cells. These findings are coincident with the potential effects of improving anti-cancer effects of Cur-NLC in HCC. We can come to the conclusion that VEGF/VEGFR-2 signaling pathway is the target of Cur-NLC. The observed modulating effects of Cur-NLC on VEGF/VEGFR-2 signaling pathway may be a kind of mechanism by which Cur-NLC exerts antitumor effects in HCC. It will be interesting to study whether inhibition of the downstream of VEGF/VEGFR-2 signaling pathway is more of an appropriate strategy for specifically blocking tumor development and progression. In summary, this is the first study revealing the fact that the partial mechanism of the antitumor effects of Cur-NLC in HCC. Based on the experimental results, this study found that Cur-NLC has significant advantages over the free form of curcumin in antitumor activity in HepG2 cells because of the improving cell uptake and endocytosis. From a mechanistic point of view, the antitumor effects of Cur-NLC might be related to modulating VEGF/VEGFR-2 signaling pathway by down-regulating expression of VEGF and VEGFR-2. Overall, these pharmacological effects of Cur-NLC strongly suggested that this nanocarrier drug could serve as a promising, novel approach for treating HCC. However, the results of this study were obtained mainly from HepG2 cells. Therefore, further investigation is required to gain full understanding of the potential antitumor effects and mechanism of Cur-NLC in other types of cells and tumors. El-Serag HB. Hepatocellular carcinoma. N Engl J Med 2011;365:1118-27. Tanaka S, Arii S. Current status and perspective of antiangiogenic therapy for cancer: Hepatocellular carcinoma. Int J Clin Oncol 2006;11:82-9. Das M, Mohanty C, Sahoo SK. Ligand-based targeted therapy for cancer tissue. Expert Opin Drug Deliv 2009;6:285-304. Umar A, Dunn BK, Greenwald P. Future directions in cancer prevention. Nat Rev Cancer 2012;12:835-48. Gupta SC, Patchva S, Koh W, Aggarwal BB. Discovery of curcumin, a component of golden spice, and its miraculous biological activities. Clin Exp Pharmacol Physiol 2012;39:283-99. Tan W, Lu J, Huang M, Li Y, Chen M, Wu G, et al. Anti-cancer natural products isolated from Chinese medicinal herbs. Chin Med 2011;6:27. Anand P, Thomas SG, Kunnumakkara AB, Sundaram C, Harikumar KB, Sung B, et al. Biological activities of curcumin and its analogues (Congeners) made by man and mother nature. Biochem Pharmacol 2008;76:1590-611. Ryan JL, Heckler CE, Ling M, Katz A, Williams JP, Pentland AP, et al. Curcumin for radiation dermatitis: A randomized, double-blind, placebo-controlled clinical trial of thirty breast cancer patients. Radiat Res 2013;180:34-43. Gupta SC, Kismali G, Aggarwal BB. Curcumin, a component of turmeric: From farm to pharmacy. Biofactors 2013;39:2-13. Sreepriya M, Bali G. Chemopreventive effects of embelin and curcumin against N-nitrosodiethylamine/phenobarbital-induced hepatocarcinogenesis in Wistar rats. Fitoterapia 2005;76:549-55. Gupta SC, Patchva S, Aggarwal BB. Therapeutic roles of curcumin: Lessons learned from clinical trials. AAPS J 2013;15:195-218. Teiten MH, Eifes S, Dicato M, Diederich M. Curcumin-the paradigm of a multi-target natural compound with applications in cancer prevention and treatment. Toxins (Basel) 2010;2:128-62. Pae HO, Jeong SO, Kim HS, Kim SH, Song YS, Kim SK, et al. Dimethoxycurcumin, a synthetic curcumin analogue with higher metabolic stability, inhibits NO production, inducible NO synthase expression and NF-kappaB activation in RAW264.7 macrophages activated with LPS. Mol Nutr Food Res 2008;52:1082-91. Kössler S, Nofziger C, Jakab M, Dossena S, Paulmichl M. Curcumin affects cell survival and cell volume regulation in human renal and intestinal cells. Toxicology 2012;292:123-35. Falchook GS, Naing A, Hong DS, Zinner R, Fu S, Piha-Paul SA, et al. Dual EGFR inhibition in combination with anti-VEGF treatment: A phase I clinical trial in non-small cell lung cancer. Oncotarget 2013;4:118-27. Korpanty G, Smyth E. Anti-VEGF strategies - From antibodies to tyrosine kinase inhibitors: Background and clinical development in human cancer. Curr Pharm Des 2012;18:2680-701. Ellingson BM, Kim HJ, Woodworth DC, Pope WB, Cloughesy JN, Harris RJ, et al. Recurrent glioblastoma treated with bevacizumab: Contrast-enhanced T1-weighted subtraction maps improve tumor delineation and aid prediction of survival in a multicenter clinical trial. Radiology 2014;271:200-10. Takahashi S. Vascular endothelial growth factor (VEGF), VEGF receptors and their inhibitors for antiangiogenic tumor therapy. Biol Pharm Bull 2011;34:1785-8. Koch S, Tugues S, Li X, Gualandi L, Claesson-Welsh L. Signal transduction by vascular endothelial growth factor receptors. Biochem J 2011;437:169-83. Yi ZY, Feng LJ, Xiang Z, Yao H. Vascular endothelial growth factor receptor-1 activation mediates epithelial to mesenchymal transition in hepatocellular carcinoma cells. J Invest Surg 2011;24:67-76. Shibuya M, Claesson-Welsh L. Signal transduction by VEGF receptors in regulation of angiogenesis and lymphangiogenesis. Exp Cell Res 2006;312:549-60. Yoshiji H, Kuriyama S, Yoshii J, Ikenaka Y, Noguchi R, Yanase K, et al. Involvement of the vascular endothelial growth factor receptor-1 in murine hepatocellular carcinoma development. J Hepatol 2004;41:97-103. Chen J, Dai WT, He ZM, Gao L, Huang X, Gong JM, et al. Fabrication and evaluation of curcumin-loaded nanoparticles based on solid lipid as a new type of colloidal drug delivery system. Indian J Pharm Sci 2013;75:178-84. Shehzad A, Wahid F, Lee YS. Curcumin in cancer chemoprevention: Molecular targets, pharmacokinetics, bioavailability, and clinical trials. Arch Pharm (Weinheim) 2010;343:489-99. Gulcubuk A, Altunatmaz K, Sonmez K, Haktanir-Yatkin D, Uzun H, Gurel A, et al. Effects of curcumin on tumour necrosis factor-alpha and interleukin-6 in the late phase of experimental acute pancreatitis. J Vet Med A Physiol Pathol Clin Med 2006;53:49-54. Monsuez JJ, Charniot JC, Vignat N, Artigou JY. Cardiac side-effects of cancer chemotherapy. Int J Cardiol 2010;144:3-15. Liu J, Chen S, Lv L, Song L, Guo S, Huang S. Recent progress in studying curcumin and its nano-preparations for cancer therapy. Curr Pharm Des 2013;19:1974-93. Kim TH, Jiang HH, Youn YS, Park CW, Tak KK, Lee S, et al. Preparation and characterization of water-soluble albumin-bound curcumin nanoparticles with improved antitumor activity. Int J Pharm 2011;403:285-91. Nair KL, Thulasidasan AK, Deepa G, Anto RJ, Kumar GS. Purely aqueous PLGA nanoparticulate formulations of curcumin exhibit enhanced anticancer activity with dependence on the combination of the carrier. Int J Pharm 2012;425:44-52. Yallapu MM, Jaggi M, Chauhan SC. Curcumin nanomedicine: A road to cancer therapeutics. Curr Pharm Des 2013;19:1994-2010. Yallapu MM, Jaggi M, Chauhan SC. Curcumin nanoformulations: A future nanomedicine for cancer. Drug Discov Today 2012;17:71-80. Lev-Ari S, Vexler A, Starr A, Ashkenazy-Voghera M, Greif J, Aderka D, et al. Curcumin augments gemcitabine cytotoxic effect on pancreatic adenocarcinoma cell lines. Cancer Invest 2007;25:411-8. Lev-Ari S, Strier L, Kazanov D, Elkayam O, Lichtenberg D, Caspi D, et al. Curcumin synergistically potentiates the growth-inhibitory and pro-apoptotic effects of celecoxib in osteoarthritis synovial adherent cells. Rheumatology (Oxford) 2006;45:171-7. Ma Z, Haddadi A, Molavi O, Lavasanifar A, Lai R, Samuel J. Micelles of poly (ethylene oxide)-b-poly (epsilon-caprolactone) as vehicles for the solubilization, stabilization, and controlled delivery of curcumin. J Biomed Mater Res A 2008;86:300-10. Lev-Ari S, Starr A, Vexler A, Karaush V, Loew V, Greif J, et al. Inhibition of pancreatic and lung adenocarcinoma cell survival by curcumin is associated with increased apoptosis, down-regulation of COX-2 and EGFR and inhibition of Erk1/2 activity. Anticancer Res 2006;26:4423-30. Somers-Edgar TJ, Taurin S, Larsen L, Chandramouli A, Nelson MA, Rosengren RJ. Mechanisms for the activity of heterocyclic cyclohexanone curcumin derivatives in estrogen receptor negative human breast cancer cell lines. Invest New Drugs 2011;29:87-97. Acharya S, Dilnawaz F, Sahoo SK. Targeted epidermal growth factor receptor nanoparticle bioconjugates for breast cancer therapy. Biomaterials 2009;30:5737-50. Sharif MR, Shaabani A, Mahmoudi H, Nikoueinejad H, Akbari H, Einollahi B. Association of the serum vascular endothelial growth factor levels with benign prostate hyperplasia and prostate malignancies. Nephrourol Mon 2014;6:e14778. Green MM, Hiley CT, Shanks JH, Bottomley IC, West CM, Cowan RA, et al. Expression of vascular endothelial growth factor (VEGF) in locally invasive prostate cancer is prognostic for radiotherapy outcome. Int J Radiat Oncol Biol Phys 2007;67:84-90. Translational research: The role of VEGF in tumor angiogenesis. proceedings of a symposium. Washington, DC, USA. November 16, 1999. Oncologist 2000;5 Suppl 1:1-57. Xu MX, Zhao L, Deng C, Yang L, Wang Y, Guo T, et al. Curcumin suppresses proliferation and induces apoptosis of human hepatocellular carcinoma cells via the wnt signaling pathway. Int J Oncol 2013;43:1951-9. Huang CZ, Huang WZ, Zhang G, Tang DL. In vivo study on the effects of curcumin on the expression profiles of anti-tumour genes (VEGF, CyclinD1 and CDK4) in liver of rats injected with DEN. Mol Biol Rep 2013;40:5825-31. Li T, Zhu Y, Qin CY, Yang Z, Fang A, Xu S, et al. Expression and prognostic significance of vascular endothelial growth factor receptor 1 in hepatocellular carcinoma. J Clin Pathol 2012;65:808-14. Raskopf E, Vogt A, Sauerbruch T, Schmitz V. siRNA targeting VEGF inhibits hepatocellular carcinoma growth and tumor angiogenesis in vivo. J Hepatol 2008;49:977-84. Hicklin DJ, Ellis LM. Role of the vascular endothelial growth factor pathway in tumor growth and angiogenesis. J Clin Oncol 2005;23:1011-27. Kiran MS, Kumar VB, Viji RI, Sherin GT, Rajasekharan KN, Sudhakaran PR. Opposing effects of curcuminoids on serum stimulated and unstimulated angiogenic response. J Cell Physiol 2008;215:251-64.